My sister Jill spent the past week with us at the beautiful Lake Michigan house in Montague. She brought along 2 sweaters that she had started over a year earlier, and were nearing completion. I admired her perseverance on these projects. With my guidance, she was almost complete with both. I had convinced her about 18 months ago that she needed to move beyond scarves, and she took the challenge. Jill tells me that I do not put mistake projects on my blog, although I would have to disagree on that front. 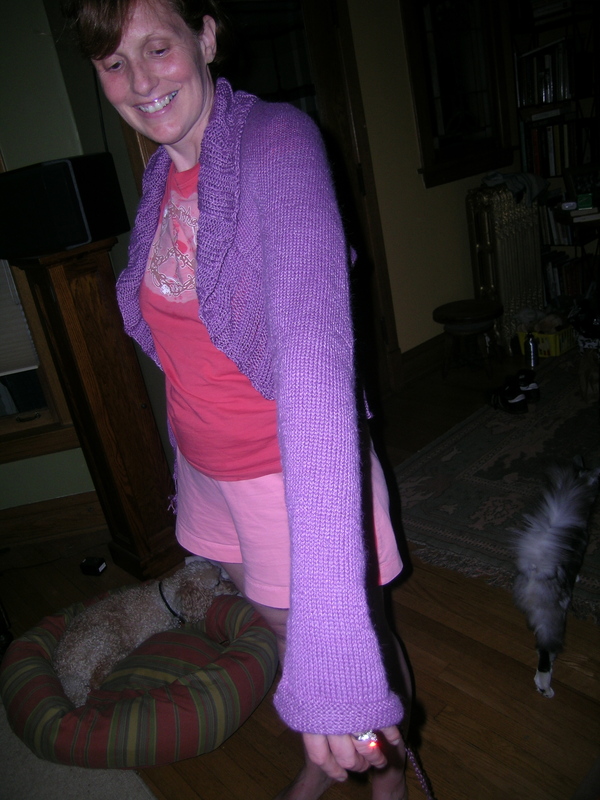 So, we decided to post photos of her second sweater, a beautiful soft purple silk/wool blend. The shrug is knit starting at one sleeve, knit across the back, and down the second sleeve. Then the lacier border is picked up all around and knit in the round on larger needles. Jill has long arms like me, and has never had many store-bought clothes that fit well in arm length. I think that she might have over-compensated on this sweater. It is not as easy to shorten the arms when they are both knit from a different direction, and we had to take several inches off. The sleeve that was cast off was fairly easy, but we had to do a lot of decreases right away to get the cuff to be snug enough. It gave the end of the sleeve a nice billowy appearance. The sleeve that started it all was not quite as easy. You cannot just rip back the same way. So, when we got back to my house in the evening, we sat up and finished it. Jill had marked off how short she wanted it, and I threaded a circular needle through at that point. Then I cut the sleeve a couple of rows shy of that and pulled back the remainder of the yarn. She then did a decrease row, and the cuff in reverse stockinette stitch. Jill’s comment was that she’s glad I did that, as I had experience. I had to inform her that it was my first time! I am glad that it worked. Now we need finished photos of both sweaters Jill.